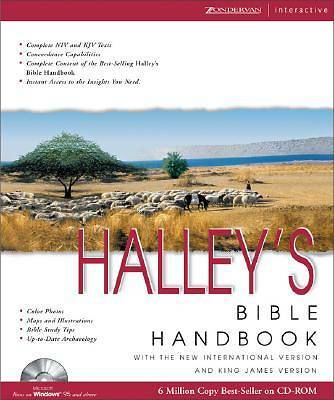 This CD-ROM contains Halley's Bible Handbook, the NIV and KJB Bibles, color maps, and illustrations. The CD-ROM version brings the benefits of this concise reference tool easy access. It’s no longer just a time-honored roadmap toward the heart of the Bible. Now it’s a global positioning system. With remarkable clarity, Halley’s offers section-by-section commentary on the entire Bible—with an organizational brilliance that makes the Bible easily accessible to everyone, and with a depth that seasoned Bible readers will appreciate. Find out about the peoples and cultures of the Bible. Discover how the Bible came together and how its text was preserved. Learn how to read the Bible, and what basic tools you need for studying it. Halley’s Bible Handbook CD-ROM will help you understand the Scriptures in a way that depends your relationship with the Person they’re all about—Jesus. Complete text of the celebrated Halley’s Bible Handbook. 90 color maps plus numerous graphs and charts, located in text for immediate access. Over 160 full-color, in-text photographs. Links from the table of contents and index to desired location in text. Zoom capability lets you enlarge all images. Bible study tips help you get the most from God’s Word. Links by verse reference or topic to the NIV and KJV. Finding the Scriptures behind the Halley’s text is just a click away! Links by topic from the NIV and KJV to Halley’s. Compatible with other Zondervan Reference Software.